The new qualification offered by the University of Wolverhampton Law School has been developed in collaboration with sector-leading employers and professional body, the Chartered Institute of Legal Executives (CILEx). The practice based programme builds technical understanding and professional behaviours needed by future Chartered Legal Executives and Solicitors. 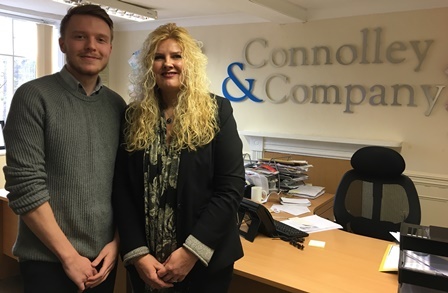 Five students, three from Wombourne based property lawyers, Connolley and Company, and two from the City of Wolverhampton Council, have enrolled on the course. Sukhninder Panesar, Head of the Law School at the University, said: “It’s wonderful to welcome the first cohort of Degree Apprentices to the Business School. We’ve been teaching Law for over 60 years and, during that time, we have been committed to reflecting the changes to practices over the years. The University is already offering Higher and Degree Apprenticeships in Chartered Management (CMDA), Higher Apprenticeship in Construction Management with pathways for Civil Engineering & Built Environment, Chartered Surveying, Chartered Legal Executive, Nursing Associate, Product Design & Engineer, Manufacturing Engineering and Healthcare Science Practitioner Degree Apprenticeships. Employers should contact the Apprenticeship Hub for more information about Degree Apprenticeships.